Some of the tiles from the villa were found to have impressions preserved upon them. We have numerous examples of scored crosses, to mark the position of nail holes perhaps, or possibly batch tally marks. We have several examples of fingerprints left by the tilers as they moved the wet tiles to the drying racks. 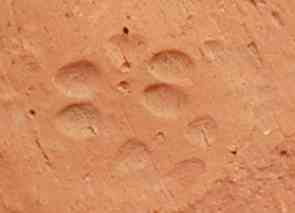 We also have examples of footprints left by dogs running over the tiles as they dried. One can imagine a first-century AD tiler hurling abuse and possibly missiles at an errant dog as it created an unwanted impression.